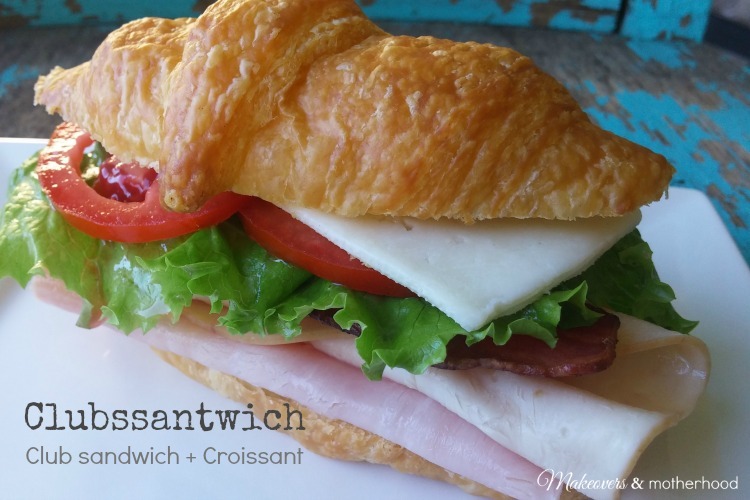 What do you get when you add the makings of a club sandwich to a croissant? The Clubssantwich!!! Sandwiches are awesome anyways, but the Clubssantwich is one of the best and yummiest lunchmeat sandwiches you’ll ever sink your teeth into! Laugh at the insane name of my awesome sandwich now, but you’re belly will be thanking you later for this insane goodness. I’m not a lunchmeat kind of gal. I feed it to my kids on crackers with cheese at a rate that could take away my nomination for mom of the year! (I wish I were kidding!) But when I’m putting together a simple, no-cook lunch to feed 5+ people, it’s no bologna that I’ll give into the processed meat lining the deli counter and have a lunchmeat sandwich. The best part about the Clubssantwich… everyone is happy! While Subway lays claim to the “sandwich artist”, they’ve got nothing on this mother! With the foundation of a Club sandwich, this sandwich takes it a step further… customization! 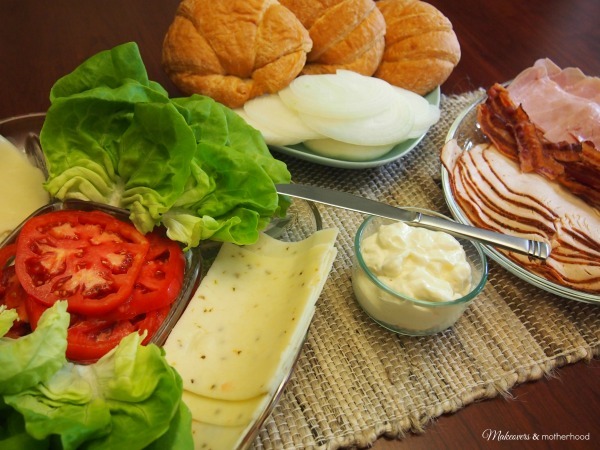 By laying out a sandwich spread, every guest can make their own and customize it to their preference! I’ve done the Clubssantwich for our extended family and for game night friends and it’s been a hit! Awesome! Croissants. I know what you’re thinking… “Hello, Captain Obvious!” But seriously, how many times do I go to the grocer and forget the one thing I really need? Let’s just say its enough to add croissants to the ingredients list. Anyways, you’ll find croissants in your grocer’s bakery. Sometimes they’ll come fresh packaged. However, I’ve also found them in the donut case. This is like torture, but just remember a long john wouldn’t make a good bun! Cheese. Get cheezy and have some fun! I’m not saying youda gotta serve Gouda, but having a variety of cheese is often nice. Bacon. Cook it, half it, serve it… LOVE IT. Add some fresh veggies like carrots and broccoli for your side dish along with fresh fruit and you’ve got a well-rounded lunch!